The Finalmouse Air58 is a great mouse, its a pure performance mouse with no bells or RGB whistles. The combination of a great large/medium shape, great buttons, the best cable out of the box and the 58 gram weight makes this mouse a dream to use. Availability and pricing is its major downside, and makes this an expensive mouse to get due to its limited availability. If you can find it for a reasonable price I would recommend picking it up. If you cant find it, I’d recommend taking a look at the Logitech G Pro Wireless (read review) at 80 grams or reserve the Glorious Model O, you can drill holes into your current mouse (not actually recommended) or you can check out our best gaming mouse post to look at a bunch of alternatives. It’s a feather weight, 58 grams! Marketing aside, this is a good mouse, it’s super light of course, but the shape is great, the buttons are really good, and the cable is best on the market. If you can find it in stock or used for a reasonable price I wouldn’t hesitate snagging one. Let’s get the most obvious thing out of the way first, this mouse is ridiculously light at 58 grams. Are there diminishing returns at this light weight? After a few dozen hours of playing Overwatch with the Air58, I can say that the light weight is noticeable and in my opinion, I played better with the Air58. Initially, the light weight combined with the slick feet actually threw me off and I was overshooting my targets on flicks coming from the Logitech G Pro Wireless, but after acclimatizing I felt my aim was better with the Air58. There aren’t official dimensions released for some reason, so I’ve done my own measurements. This is a medium to large mouse, it’s shorter in height than the Logitech G703 but a little longer. It’s roughly the same length as the Steelseries Rival 600 while slightly shorter in height than the 600. If you find the G Pro Wireless slightly too small or the G703/Rival 600 a little too big, then this is going to be in your sweet spot size wise. The shape is a safe ambidextrous shape, with side buttons for right handers only. The shape is good for all grips and particularly excels at palm because of its shape and fingertip because of its super light weight. The holes are obviously its signature that enable the Air58 to be as light as it is, a side benefit of the holes is that my hands didn’t sweat one bit in high intensity gameplay. Despite having all the holes, the structure of the mouse is solid, no flex when squeezed and no rattles when shaken. I did have a little creak on the left side of the mouse when first using, but it seems to have settled in and I can’t reproduce the creak. The holes were a little uncomfortable at the start on my ring finger as I was used to using the mouse with a tight grip. I was quickly able to adjust and now hold the mouse very comfortable with very little fatigue over long gaming sessions. The top coloured (comes in Cherry Blossom Red and Blue) surface of the mouse is made of a plastic that has a hint of soft touch. The grips on the sides are made of a more traditional hard black plastic, I didn’t find any issue with gripping and picking up the mouse since the mouse was so light. The cord of this mouse is by far the best out of box cord found on any mouse. It’s ridiculously flexible and made out of a light braid, this mouse does not need a bungee of any sort, the cable is a little fluffy so it might not fit into a bungee even if you wanted it to. The combination of the amazing cord and the super light weight did make this mouse kind of feel wireless. 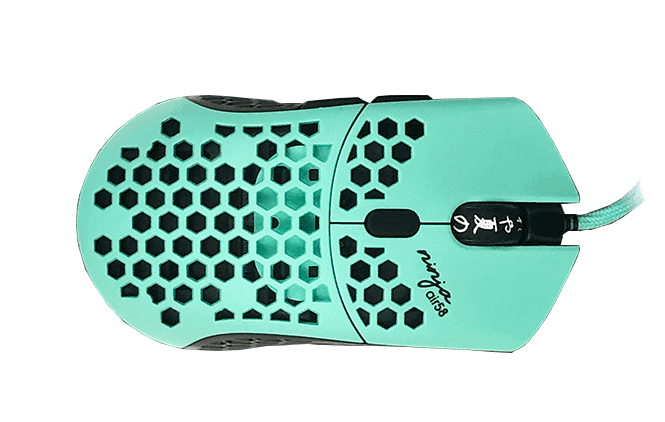 On the underside you’ll find more speed holes and 4 slick feet, the feet are great and provide a really good glide, this mouse flies if you want it to. Aesthetic wise, I’m not a fan of the branding on the mouse and don’t really care about the kanji on the scroll wheel, but I’ll take the design considering its performance. The primary and side buttons are very good, tactile, responsive and well placed. They’re not as good as the god-tier G305 buttons but very very good as good as the Rival 600 or G703s. Finalmouse uses Omron switches for their buttons, and they feel great, they’re likely going to be reliable and performant for 20-50m clicks at least. The primary clicks have a strong comfort groove reminiscent of the Razer DeathAdder and the effect is great, super comfortable for palm grips. The side buttons are nice and blocky, it’s very easy to feel which button you’re pressing and the response is very good. The scroll wheel is okay, it’s not particularly grippy or tactile so it’s not the best scroll wheel I’ve seen on a gaming mouse. The middle click similarly, is ok, a little squishy and has a higher weight than I’d prefer but not a huge deal. 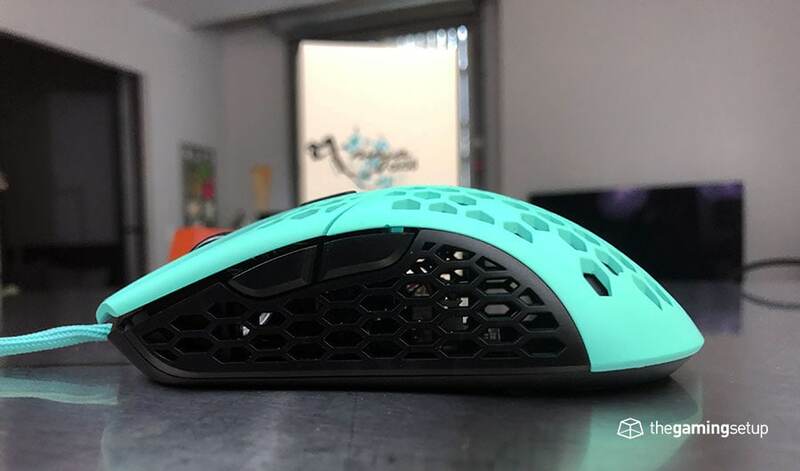 The Finalmouse Air58 comes packed in with the ever common Pixart PMW3360, of course this means the mouse is free from acceleration and it won’t spin out. Lift off distance is low with no available adjustments. No prediction here. My mouse writing isn’t getting any better. 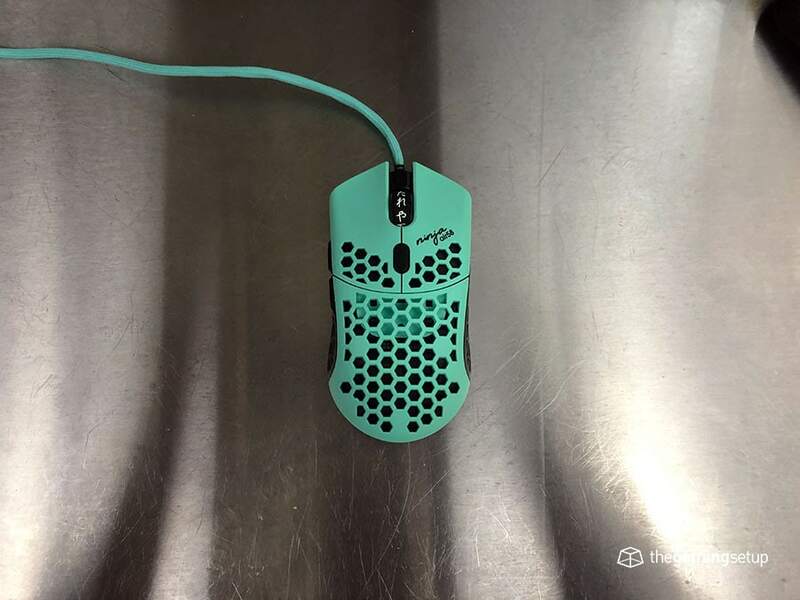 It looks like the Finalmouse implementation of the sensor is set to 500Hz. This might be a cause for concern to some gamers wanting 1000Hz but I didn’t really notice any difference in response and in real world scenarios that difference would theoretically would be a 1ms in reaction time. Not much else to say about the sensor and performance, its a top-tier sensor combined with a great cable and a super light mouse. The Air58 is an absolute top-tier performer. 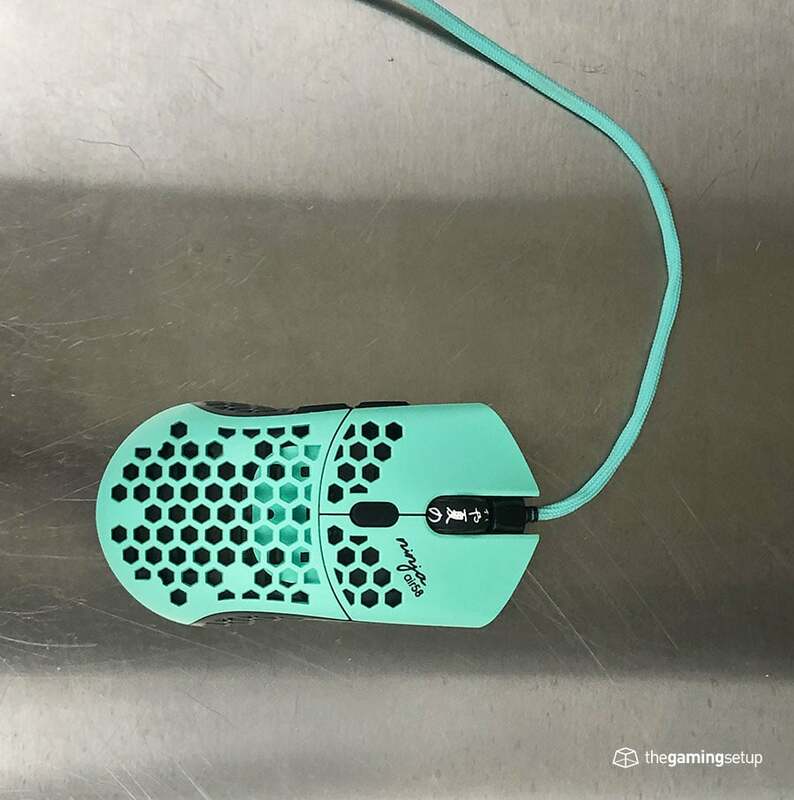 This section will be short, the Finalmouse Air58 does not have much in the way of features; no wireless, no RGB, no weights (obviously) and no software. This mouse is a minimal pure gaming mouse, plug and play. The previous generations of Finalmice (can I do that?) have had issues with scroll wheels breaking, but redditors have been able to get them replaced via customer service. 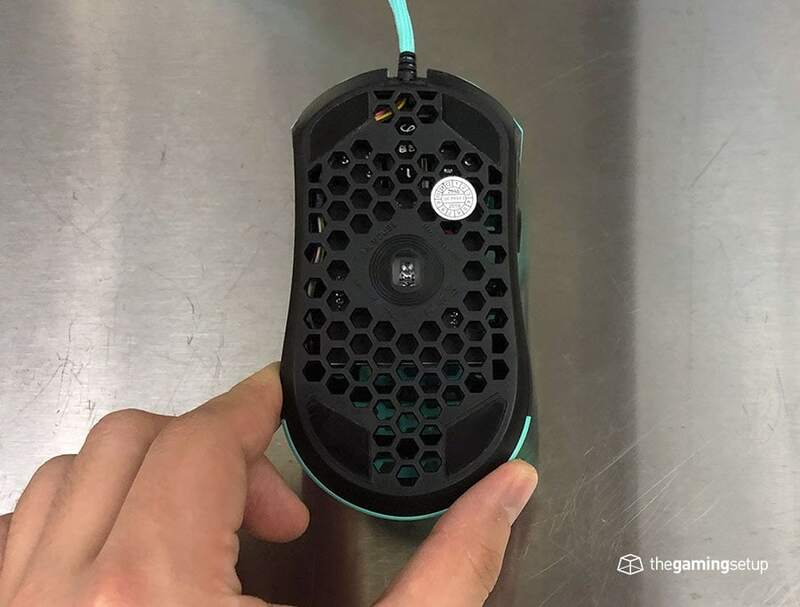 The Air58 looks to have the same scroll wheel as the the Ultralight series. Here’s a video of a Ultralight Phantom broken scroll wheel. This is a top tier mouse, it’s a high performer with a great shape and obviously a super light weight. The buttons feel great, the mouse feels great to use for long periods of time, there’s very little to fault the product itself outside of maybe the scroll wheel and reliability issues. We can’t recommend this mouse in the best gaming mouse list, because most people won’t be able to get it even if we did recommend it. 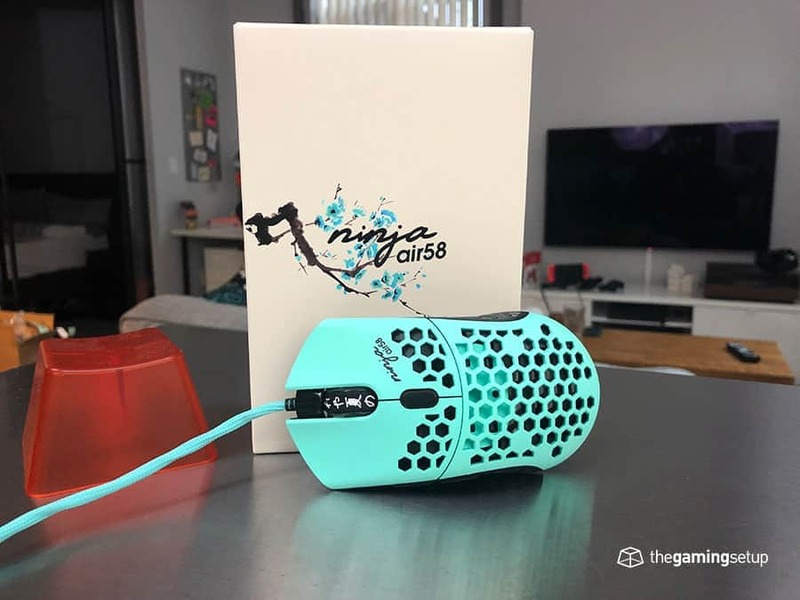 The huge caveat for this mouse is the availability and pricing, Finalmouse make very limited runs for their mice and as a result, the Air58 has a very gigantic aftermarket price. If you can find it via retail, I’d definitely recommend trying it out and getting it if you like medium/large mice. Otherwise, you can try to find it on eBay, they have good buyer protection if the mouse doesn’t arrive as expected and is likely your best bet to snag one quickly. Ah shoot! To clarify it’s not as tall as the G703, but longer. 4cm in height for the Air58 vs 4.3cm for the G703. Updated for clarity!